To begin, let me clear up a few things. J. Dyanne does not communicate with little moon aliens or Martians. She does not have a crystal ball, nor was she responsible for the outcome of the last presidential election. And she certainly does not command the dead. She may speak with them from time to time, but command them? Who can do that? What could you possible use to exert pressure to obey? I mean, they’re already dead. Perhaps threaten them with life? 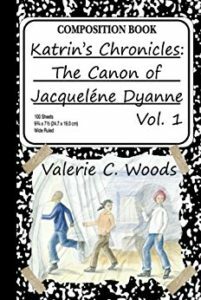 I am thrilled to welcome Valerie C. Woods and her charming middle-grade novel, Katrin’s Chronicles: The Canon of Jacquelene Dyanne Vol. 1. Take a love of Sherlock Holmes, add in coming of age during the Civil Rights Era, and sprinkle it over with sisterly devotion and a touch of magic, and you have Valerie’s warm and satisfying debut mystery. We talk about her work in theater (including Something For Everyone, the book of monologues she wrote after being unable to find material for herself outside of Lorraine Hansberry’s A Raisin in the Sun) and how it led to her first screenplay, a Disney Fellowship, and a television career that included Any Day Now and Touched by an Angel. You can check out all her credits here on her website; she can also be found here on Twitter. And do not miss the books she publishes. In addition to Sherlock Holmes, Valerie was influenced by the Harry Potter series and my own favorite middle grade novel, A Wrinkle in Time. She also gave a shout-out to Harriet the Spy, Nancy Drew, and Mary Stewart’s Arthurian saga that begins with The Crystal Cave. I want to mention the title of one of the books Valerie published and is editing the sequel to, Chet Baker: The Missing Years by Artt Frank. Finally, do not miss Valerie’s take on the trope of “the chosen one,” about 17 minutes into our conversation. Laura Brennan: Valerie C. Woods is a writer/producer in television and film, and is also a publisher, editor and author. Among her TV writing credits, she has worked on Soul Food, Any Day Now, and Touched by an Angel. She founded the independent press, BooksEndependent, and her middle-grade novel, Katrin’s Chronicles: The Canon of Jacquelene Dyanne, Vol. 1 combines mystery with history, and just a touch of magic. Valerie, thank you for joining me. Valerie C. Woods: Thank you for having me. It’s great to be here. LB: So you have written for television and film, and you’ve written fiction and poetry and a book of monologues. Has it just always been writing for you? VCW: Well, it all started because I thought I wanted to be an actress. And I moved to New York from Chicago to be the starving artist/actor, and we were preparing for an actors’ showcase and the only material I could find for black women that represented me was something from A Raisin In The Sun. And I realize there wasn’t a lot of material that was written for black women, so I started writing my own material for auditions and showcases. And then everybody in my acting class wanted me to write something for them, and I did. Turned out I had about 25 acting monologues for men and women and decided to publish them. I got rejected from all the play publishers, Samuel French and all of them. And then I published it myself, sold out 1100 books, and then Samuel French said, okay, we’ll publish it. Add 25 more. And so that began my life as a writer. LB: So you were actually an independent author long before it was cool. VCW: Yes! In fact, when I started my press, I remembered, oh, wait, this isn’t new. Now it is so much more easy than it was back when I did it. The new platforms for Amazon and all the different self-publishing things, and digital and e-books. It’s a breeze to produce, physically produce, but the same skills and creativity and editing is needed for the content. LB: Yes. Yes, but you no longer need to have a garage full of books. VCW: No, you don’t. And you don’t need to wait for someone to say yes. LB: I love that. You can get directly to the reader. LB: So, let’s talk just a little bit about Hollywood. It is still quite a step from writing monologues for your friends to, suddenly you’re writing on shows like Touched by an Angel. There must have been some steps along the way there. VCW: Well, I went from monologues to writing a fairly average couple of plays. And then I adapted one of my plays to a screenplay. And someone told me about this Disney fellowship, that I should apply. So I took this play that I adapted to a screenplay, I worked on it for about a year and a half to really polish it, and I submitted it to Disney, to the Fellowship. It’s when they were still doing screenplays. And I got in. And after the year at Disney, my screenplay got me a television job. VCW: Oh, thank you. No, it was a great experience. It was one of the best writing experiences I had. LB: So then you had a career in television, then you decided, but that’s not enough. I want to be a publisher and an author of fiction. VCW: Well, you know, television was great and I met wonderful people, and I realized around the 2007 writers strike that I was very much, you know, WGA, let’s do our part. I picketed and everything. But I really took a step back and ask myself what is the medium that I love the most? And I grew up reading and loving novels. I watched television, but it wasn’t my first choice of entertainment. Reading always has been. And I wrote a short story for my older sister, for her birthday, because they didn’t have a gift for her. And she’s my biggest writing promoter. So I wrote her a short story for her birthday, which was a highly fictionalized story of two sisters, the both of us, and a summer excursion. We both love mystery novels, detective novels, and it turned into like, this girl detective short story. She loved it. As did everyone else in the family. And I wrote her another one for Christmas, and another one for Mother’s Day. And I said, I think this is a book. And it is. And it’s a highly fictionalized autobiography of me and my sister. LB: So, I just want to make sure that someone who hasn’t yet picked it up, what would they need to know about Katrin’s Chronicles to be able to follow this conversation? VCW: They would need to know that this is about two sisters who like uncovering mysteries and discover that the biggest mystery is within themselves. VCW: Thanks! That’s what I think human development is all about. It’s not just as children, but even as we grow, were still uncovering mysteries about ourselves. And I think that’s very important, that’s evolution, that’s growth. And the biggest mystery is the human mind and our motivations and our relationships and all of those things. I find that very intriguing. LB: First of all, the book were talking about is Katrin’s Chronicles: The Canon of Jacquelene Dyanne. This is just volume one, which is part of the title, I love that. It has an episodic, short story feel to it, but there are overarching mysteries within it that I would love to talk about. Some of the mysteries are whodunit but there are also mysteries about who the girls are becoming. I found this is a perfect middle grade novel because it’s really about coming into your own power. VCW: Exactly. Exactly. One of things I’ve experienced and what I see historically in racing girls and being women, is there is this subtle and often not-so-subtle drive to silence women and girls. Or to subvert our own power to someone else. And were not encouraged to listen to our own voice. In each person has a strong, intuitive or inner voice and we shouldn’t deny it or curtail it. And also, on another level, I’m a history buff and so the true history of our country and of the world really is often, as they say, the winners write the history. Doesn’t mean that’s what happened, but that’s who wrote it. The major tagline of the book is the grandmother saying, if you don’t write your own history, somebody else will make it for you. And as we study history of women and study history of African-Americans, where uncovering how strong and significant a role we all played in world history. I mean, look at Hidden Figures. So that’s very important for me, to encourage girls to trust their own voice. LB: Is that why you targeted middle grade in particular? VCW: That’s part of it. The other thing I realized, that as such a great reader as a young person at this age, especially — you know, I read Harriet the Spy, I read Nancy Drew, I read all of these but I’ve asked around, and I’ve researched and I think I may have written the first black girl detective novel. I’ve seen black women detectives, but not girls, not middle grade girls. And I looked for them. LB: What a lack! Oh my goodness, what a hole. VCW: And so I wanted to write a book I would have liked to have read when I was 11. LB: I was so interested that you actually set this around about the same time that you were 11. LB: So why did you choose to make it be about then as opposed to being about now? VCW: Well, primarily because it was for my sister. It started out a joint memory book for the two of us. So when I wrote the first short story, I included think from our childhood that she would appreciate. Because when we were, during our summers growing up, she’s my older sister, she’s the one who always planned our adventures. And I followed along. So I wanted to talk about that and also to commemorate that for her, for her birthday. And how she, what she meant my life. So that’s why I chose that period. And of course I like history, and when you go back to that period, it’s amazing what a turning point in our country that time once. LB: Right. And we’re talking about 1968, when this takes place. VCW: Right. Correct. I mean, so much happened in that one year. LB: Yes. It was astonishing. VCW: And being an impressionable child at that time, one of the things in the book you know, she reads the newspaper but she stopped reading the front of the newspaper because it was too traumatic. She would read the sports in the comics. But the front, you know, so who else died today? And isn’t that the same thing that’s happening now? LB: Oh, absolutely. Just logging onto Twitter can be traumatic. VCW: Yes, it is. But it’s not that you hide your head in the sand. Yes, it’s happening, and you need to know what your capabilities are and what you can do to affect change. And it’s not that this 11-year-old 12-year-old was going to go March downtown with the Democratic convention — 1) her parents wouldn’t allow it, and 2) it wouldn’t have been safe. But she could work in her own community and in her own situation. Find where you can make an impact, no matter how old you are. LB: I love how much power and influence the girls have, how much you really give them. But I also want to talk about how loving the relationship is, how really genuine and warm all the relationships in the book are. It’s just something you do so well. VCW: Thank you. One of the things wanted to be clear about is that, too often when I read or even watch television shows or read books, the parents are idiots. And I don’t think you need to sacrifice the intelligence of the parents for the kids to be smart. LB: I think that’s absolutely true. I mean, parents can be damaged and imperfect. VCW: Exactly. And also the generational — because the grandmother and the great aunt — listening to the wisdom of your elders. And also elders who give you permission to find your own truth. I wanted to explore the benefits of interest generational exchange of wisdom that I think is important. We can sometimes lose track of or lose touch with what we can gain from our parents and grandparents. LB: The warmth of the relationships actually reminds me a lot of your television work. Something like Touched by an Angel, and the creation of family and different kinds of family. Was that always something you’ve been interested in as a writer? VCW: I realize I am discovering my voice as a writer as I write. And I rarely go in saying, oh, I’m going to write about this thing, or anything like that. It’s a question of, I need to write to know what I have to say as some famous writer said. That’s not my quote. I grew up in a big family, a big extended family in Chicago. And although I didn’t get along with everybody, all of my cousins and everything, I felt a strong sense of family. It’s something I naturally gravitate towards. We’re not the Waltons by any means, but it’s — connections between siblings and parents and cousins and aunts and uncles have all kinds of levels and generally are a child’s first experience of love, conflict, drama, is within your family. And it’s a rich area to explore. I can’t deny that I’ve been impacted by the Harry Potter stories. I love JK Rowling’s books, even her adult books and her detective series. I think we can all relate to coming-of-age, growing up, what kind of families we had or what kind of families we wanted to have. And as far as the black experience in America, we often just get one type of story. And we need to see all the different stories within America and within communities. LB: It’s also influenced, I think, by Sherlock Holmes. There’s an element of Sherlockian-ness to it. VCW: Oh, absolutely. I am a Holmes fan as well. My sister introduced me to Sherlock Holmes, and she introduced me to A Wrinkle in Time. My mother was, as I say in the book, we never were denied library privileges. My mother had us in book clubs, she would read to us at night. So books and stories are very much a part of my life. And yeah, I love Sherlock Holmes and that deductive reasoning. And I’m also influenced by the intuitive part of life, the unexplainable things that even logic can’t explain. LB: Since you mentioned A Wrinkle in Time, I can absolutely see it. I hesitated to call this paranormal because it’s not that, but the way A Wrinkle in Time deals with things that are unexplained, so too does this, but in a very different way. VCW: Yes, because I actually do believe we have intuition and that intuition can be fostered. Where not taught to depend on our intuition very much, we’re taught to be practical and logical and things like that. But when you look at most scientific advancements, it was an intuitive leap that the scientist or mathematician — you know the periodic table was in a dream. Einstein’s, you know, a lot of it came from dreams and an intuitive leap, of course based on other things. But we really, I think, need to pay more attention to those intangibles in our life, which I guess the Industrial Revolution kind of tamped down on it, on that type of thinking. LB: I mentioned earlier that it’s about, a coming-of-age story in terms of coming into one’s own power. Part of what makes Katrin special, she’s telling the story about her sister as the central figure, much like Watson and Sherlock, but a good part of this is actually about what makes her special, and her coming into her power alongside her sister. VCW: Yeah, you know, one of my favorite series of books are the Merlin stories, the Hollow Hills, Crystal Cave, Mary Stewart books. And what intrigued me is that, the story of King Arthur is always focused on Arthur. But Arthur would not have been Arthur without Merlin, or without his parents, or all of these of the characters. And we think the Chosen One, even Harry Potter as the Chosen One, we’re all chosen. And we’re all chosen to do a specific role. And our job is to figure out what we have been chosen to do in this lifetime. And everyone has a role. And everyone is chosen. There’s not just one. Because nobody can do anything alone. LB: I love that! Oh my gosh, that’s beautiful. VCW: Even when you look at our spiritual leaders and our politicians, yes, they are the leader… One of the things I loved about the movie Selma is how the director, Ava DuVernay, made it clear in the story that Dr. King, even he recognized that he was not the movement. He wouldn’t have done that on his own. It was clear how much his wife impacted things, the other people who were the organizers and the marchers. We always look to Dr. King, rightfully so, as someone who led a movement, but he wasn’t the only person in the event. And without the other people, there would have been no movement. And when you look at that and recognize, you know sometimes you get the feeling, oh, I’ll never be an important person. Yeah, you are important! Everyone is important to create change. LB: So you’re not just a writer yourself, you’re also really a champion of other writers. VCW: Exactly. In fact, one of the reasons I started my press is that I knew some really great writers who didn’t have publishing deals. You know, the Big Six publishing industry is a whole other topic, we won’t go there. But, I started publishing becauseI know so many great writers. And just last year, a colleague of mine from Touched by an Angel invited me to be adjunct faculty for Stevens College MFA in Screenwriting and Television. And I said yes. So I’m mentor to five screewriting students, five television writers, and it’s very energizing working with writers and helping them formulate their ideas. It’s energizing, not only being in that creative space, almost like being in a writers room, but it also energizes my own creativity. So I really like that. And I belong to two writers groups that I go to, one is more focused on novel writing and the other is more focused on television and film. And having that kind of a deadline to show up with pages has been really focusing for me. If you can find a group of writers and supporters that you trust, it’s invaluable, I think, for writers. Because of course we do spend a lot of time alone in front of a computer and it helps once a week or once every other week to be with a group of like-minded people, share what you’ve been working on, share any problems you might be having an know that the people you’re with at least will listen. And once you start talking it through, a lot of times the answer comes. And of course, nothing like a deadline to have pages ready. VCW: Well, you know, after I published this book, I naïvely thought I would have the sequel at least a year later. But then I started publishing, and when you’re publishing other writers, that’s a lot of work. So I’m marketing the books that, the titles that I have at my press, which takes a lot of time. I’m currently editing a second volume from one of the writers who I published, a writer who, a jazz drummer, bop drummer with Chet Baker. And he’s, this is the second volume of his memoirs about Chet Baker and working as a jazz musician in that period, the ’70s and ’80s. And I’m also working on my next Jacquelene Dyanne, Katrin’s Chronicles. And I have a book assignment that I was given, to write about an Italian inventor, Antonio Meucci, who many people, especially Italians, believe is the father of the telephone and not Mr. Bell. Fascinating story. And the books that I publish are books that I feel are suitable for adaptation to film or TV. I’ve really come to narrow down my focus there, because I like blending the written word with the visual storytelling. And this past summer, I did a series of staged readings of scripts adapted from books. It’s called Staged Lit, the series, and I hope to continue with doing that. LB: That is fantastic. So, if somebody wants to follow you and find out more about you, where can they go? LB: Perfect. And I’ll link to that in the show notes. Valerie, thank you so much for joining me today. VCW: Laura, it’s been a pleasure. Thank you.